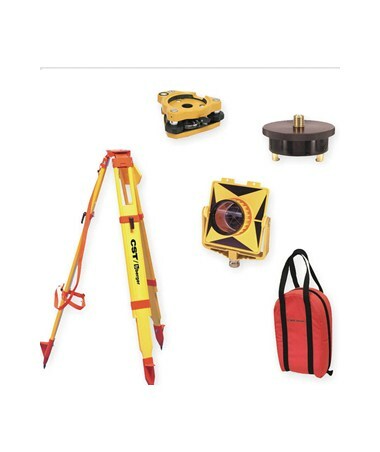 The CST/Berger Total Station Basic Starter Kit is the perfect accompaniment to your new total station. The Basic Starter Kit contains everything you need to get started:a tripod, single prism, tribrach and tribrach adapter, plus an extra tall bag to store your accessories. The tripod is sturdy and reliable, featuring hard maple legs and fiberglass dowels with inner core designed to eliminate swelling and shrinking. Built for worry-free placement, the tripod's legs have pointed shoes that can be punched in the ground, and the extension legs are double-banded to provide you with extra stability. Attaching your total station to the tripod takes only a few seconds with the quick clamp, which features a large round precision tuned head and wide mounting hole to aid in plummeting. And of course, you'll be able to easily carry your tripod with the convenient shoulder strap. The Single Tilt Prism included in your Starter Kit offers outstanding performance, with precision ground glass up to 2 arcseconds and a 0/-30 millimeter offset. Built to last, the aluminum yoke has a lifetime guarantee, while the Delrin washers are known for their long-term performance. The single tilt holder tilts up to 350 degrees, allowing you to position the prism in exactly the direction you need. A tribrach plays a significant role in ensuring your measurements are accurate. With the Tribrach, however, you won't need to worry about compromising your horizontal and vertical angle measurements, since the tribrach's high torsional rigidity ensures it moves smoothly yet accurately even after years of use. 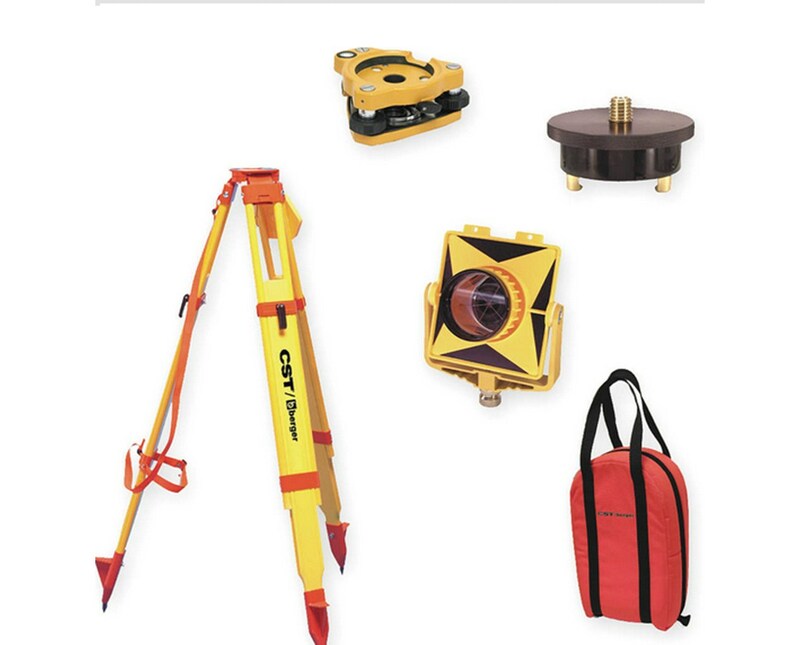 The Starter Set tribrach without optical plummet has a universal 5/8-11 base plate, and at only 1.65 lbs, makes sure transporting your total station and accessories isn't a burden. The circular level, which is used to adjust your total station, is accurate up to 10 arcminutes per 2 millimeters, enabling you to place easily adjust your total station's overall orientation.Attach your tribrach to your tripod with the popular 61-2521 adaptor, which features a rotating friction top and adjustable tension, allowing you to point prisms after attachment to the tribrach. On the go to a new location? The rugged extra tall bag fits the prism, tribrach, and adaptor, allowing you to carry your Starter Kit quickly and comfortably.Wherever you go, you'll find that the Total Station Basic Starter Kit compliments your total station perfectly.